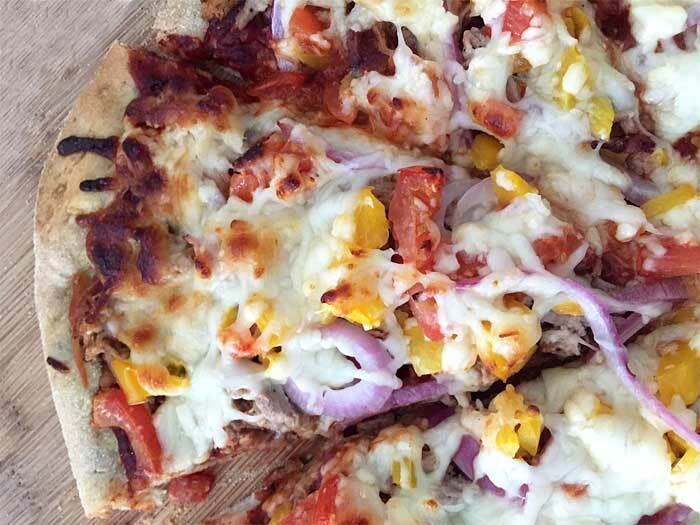 This BBQ Pulled Pork Pizza is deliciously easy to throw together. Just pulled pork, BBQ sauce, tomatoes and cheese. 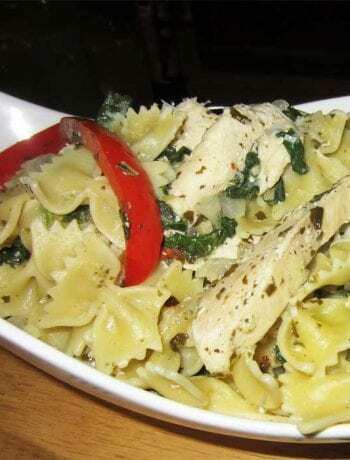 Perfect for a quick lunch or busy weeknight dinner! I love pizza! If you have been reading my blog or following my Instagram you know that I will eat just about any pizza, and I’ve tried a lot of them. So far I’ve made a vegetarian 3 Pepper Pizza, a delicious Thai Chicken Pizza, not to mention my favorite Homemade Pepperoni Pizza. 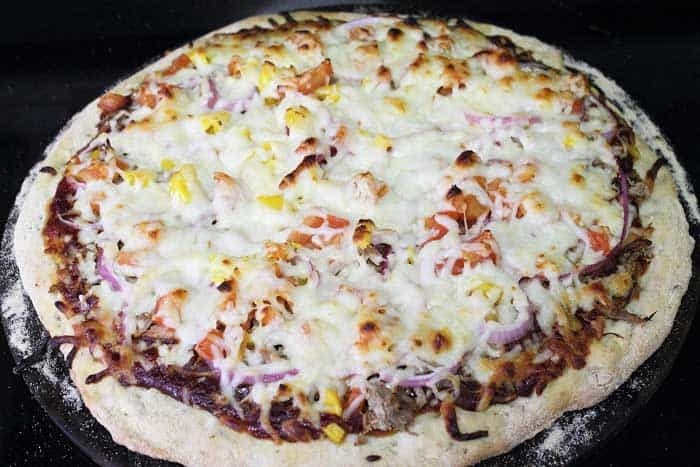 Not so surprising, I am always up for trying new pizza concoctions so when I saw a Double Cheeseburger Pizza on a list of the most unusual pizzas I just knew that I had to add it to my pizza repertoire (for all us meatlovers out there) along with this BBQ Pulled Pork Pizza. And, believe me, every single on of these pizzas are sensational! 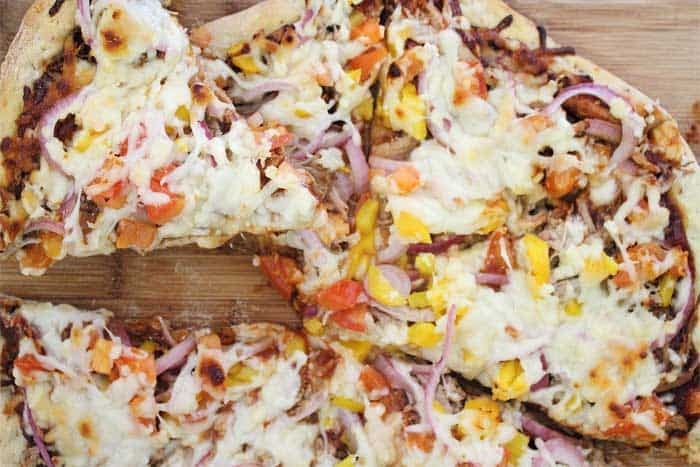 Today’s BBQ pork pizza is similar to my BBQ Chicken Pizza except I used shredded pork instead of rotisserie chicken. 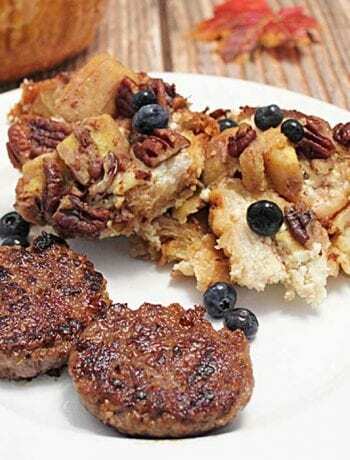 It is so easy to make and most of the ingredients are probably in your pantry right now. Now just roll out the crust or purchase one that’s ready to go, pile on the ingredients and bake. Just look at it making all that cheese melt in the oven. Oh, I can’t wait! My husband even said it was one of the best pizzas he has ever had! Now that’s what I like to hear! 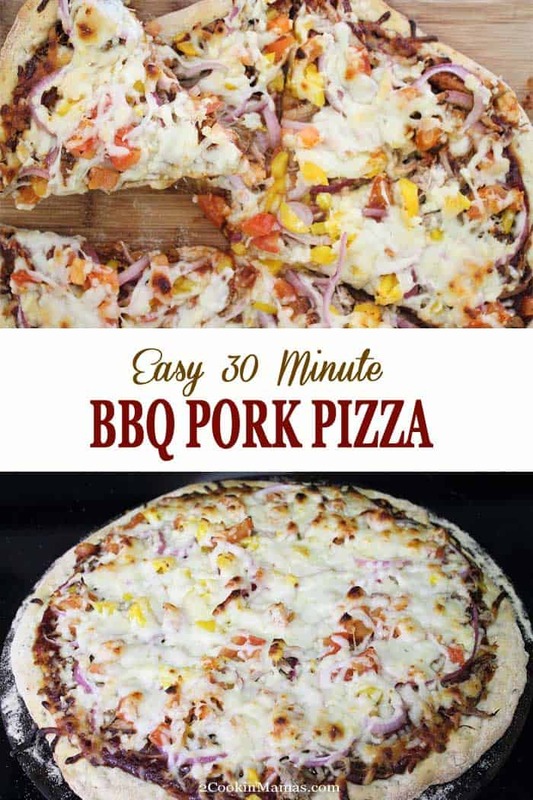 Tip: Plan ahead of time for your week’s worth of meals and fix a pork loin dinner like our Tex-Mex Pork Loin prior to preparing this pizza. It will give you 2 or more dinners for the week. 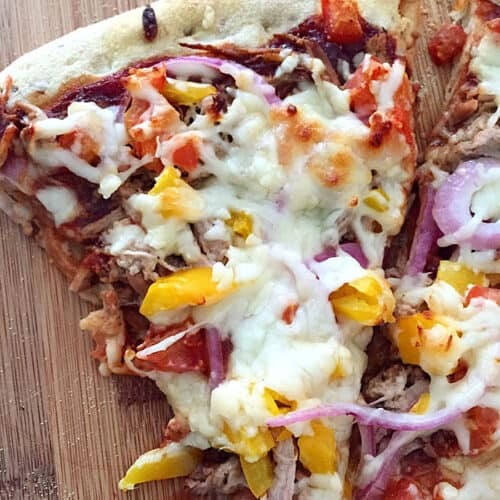 This BBQ Pulled Pork Pizza is deliciously easy to throw together. Just pulled pork, BBQ sauce, tomatoes and cheese. 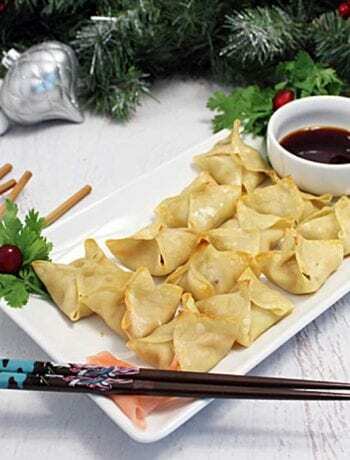 Perfect for a quick lunch or dinner! Place pizza stone in oven and preheat oven to 500 degrees. Leave stone in oven for 30 minutes. Just prior to removing stone from oven, roll out pizza dough into a circle that will fit your stone. Remove stone from oven, be very careful as stone will be extremely hot, and place on top of stove or other heat resistant surface. Sprinkle with corn meal. Place circle of dough very carefully on stone. Mix pasta sauce and barbecue sauce together and spread over crust, keeping it at least 1/2″ away from edge. Top with pork (as much or little as you want), onion rings, tomatoes and peppers. Place back in oven for 20-25 minutes or until cheese is melted and sauce is bubbling. No pizza stone? No problem! Use a cookie sheet with sides. Do not preheat in oven just spread with corn meal and place your crust on the sheet. Continue with directions as stated above. Your recipe sounds good! I don’t eat pork but I will definitely substitute it for something else. I bet this sauce would highlight nice crisp vegetables too like bell peppers and broccoli and maybe stir in a little spinach. 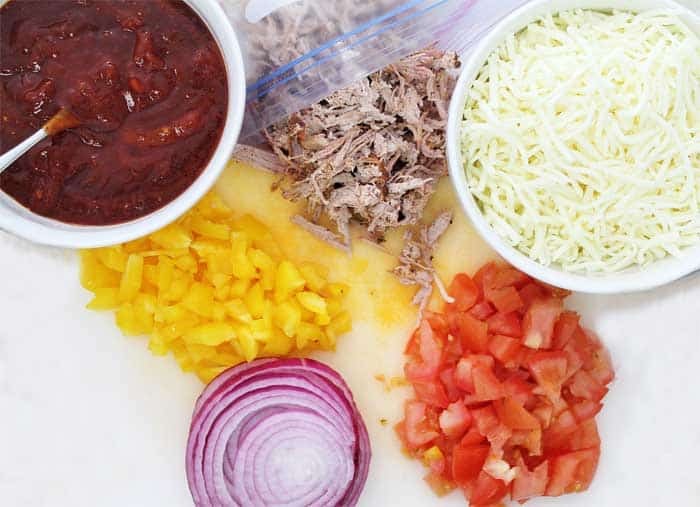 This is the perfect recipe for leftover pulled pork. Saving this for the next time I make pulled pork.